Harbinger Delivers on Time Every Time! We excel at managing projects. In fact our customers find this to be one of our greatest assets. We assign a Project Manager as the single point of contact for the client for the duration of the project. Using resources within Harbinger the Project Manager will control every aspect of the project and begins by developing a project manual. 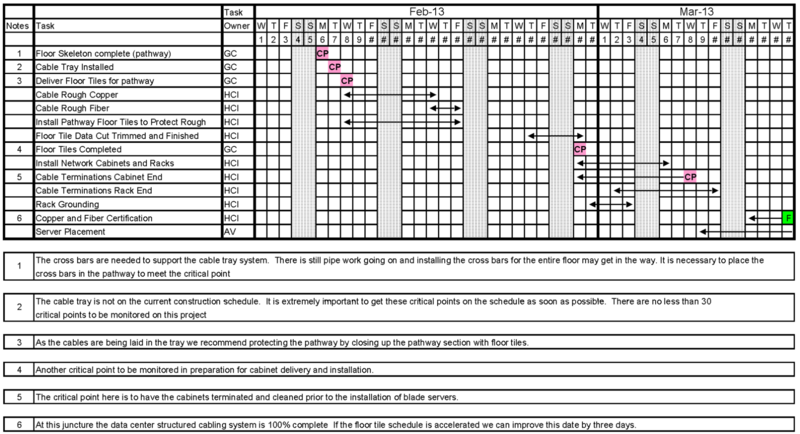 The project manual is reviewed by an on staff RCDD (Registered Certified Distribution Designer) for standards and code compliance and a critical task chart is developed for the project. early as possible so that they are discussed and clearly understood during construction meeting. By focusing on a set of bi-directional critical tasks the PM is assured of completing our scope of work on time without contributing to construction delays. In new construction we find that pushing project responsibility to all levels of the work force gives us the ability to adapt to the ever changing construction schedule. Be careful of proposals with penalties for construction delays or changes. These are typical traps set by low bidders to make up margin. We expect delays and changes, and adapt to them efficiently without penalties.